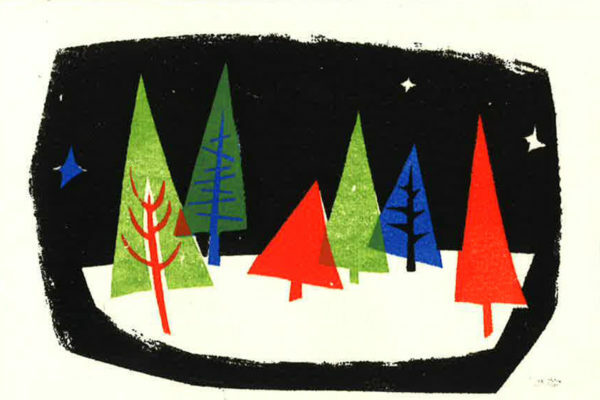 It’s that time of year again, the third iteration of our annual Vintage Christmas Card exhibition! From November 22 – January 7, we are presenting Christmas Cards shared between the artists of the northwest, and their family friends. For most of the 20th century, many regional artists created original works of art to send to their fellow artists, friends and families to celebrate the Holiday Season. The cards were created using relief printmaking such as woodcut and linoleum blocks as well as watercolor, oil, collage and other materials. Some cards visitors will recognize from our first exhibition in 2015. While some crowd favorites will return, many new cards will be on display, from such artists as Jacob Elshin (1892-1976), Danny Pierce (1920-2014), Glen Alps (1914-1996), and many more.